The ongoing work taking place in the newsrooms of daily newspapers, the ongoing race with time, with the deadline for articles, activity that tests both body and soul, offers little chance to convince journalists even just to clean their desks, drawers or cupboards. And even if it happens sometimes, persuaded by constant stress, journalists have little time to sort the accumulated material, manuscripts and photographic collections and archive them for posterity. In general, everything reaches the trashcan, indiscriminately. The situation is different for photojournalists. They learnt during constant competition with the same time that it is advisable keeping photographic negatives, because in hysterical situations that occur regularly in a newsroom it is often necessary to find quickly some old pictures. However, order is required to find something easy, it needs a system. If it exists, it is much easier to locate a portrait, a photograph of a public building made years ago or possibly a group of people or whatever. Therefore, most photographers have developed their own “homemade” archives and are keeping their negatives in these systems. There was substantially no different the situation within the newsrooms of the newspapers of Cluj. Manuscripts have not been placed in the archives, but were usually destroyed. They kept only some important economic and financial papers and documents, in the best case ... And sometimes even some of the photos. Of course, before the end of the Second World War, newspapers have rarely published photographs; the picture in the newspaper became popular just starting with the second half of the 20th Century, so it is not surprising that most of the important photographic collections were inherited from that period. Unfortunately, there were lost or not yet discovered photographic negatives of the large workshops and studios of Cluj, and it is feared that they will never be discovered. Therefore, it was a big surprise the discovery in 2010, during the dismantling of the former photo lab of the dailies Făclia and Igazság from Cluj, of negatives of press photos taken between 1960 and 1990. The laboratory was originally founded by the Hungarian daily Igazság, then serving both newspapers, and afterward, in the late 1980s was passed over to the Romanian newspaper Făclia. When this newspaper liquidated the laboratory, it did not want to keep the archive of negatives. The distinguished photographer colleague, who subsequently passed into eternity, explained this option in the simplest way: - Who is any more interested in these photographs of the communist era? 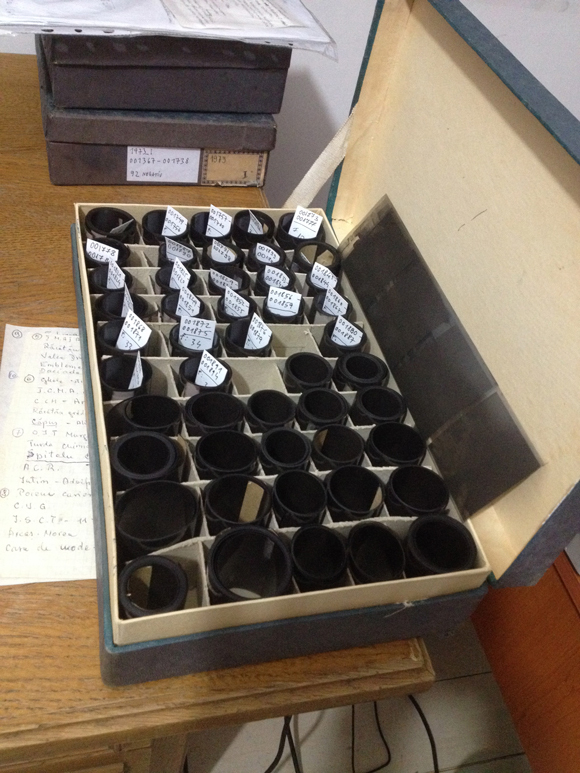 Thus, the negatives came first in the office of the author of these lines, and then, after the founding of the media archive of the Minerva House from Cluj, the boxes containing the negatives were stored in cupboards. This way became five years ago the sole property of the Minerva Cultural Association this valuable collection of press photography, constituting an archival collection containing original images captured by professional photographers of the two newspapers in the second half of the 20th Century, images that are documenting the communist regime for generations to come. A small part of the more than 30 thousand images taken on professional 6x6 cm photographic film were published by the newspapers Igazság and Făclia, but the vast majority of the photos in question remained unknown for the general public. However, processing the archive had to wait a few years. Since last year, through the collaboration of two institutions from Cluj, the Minerva Cultural Association and the Conset workshop of Tranzit Foundation, with the financial support of the Romania One Foundation, we managed to digitize the entire collection of negatives and to build a website that is making them available to the general public, who can view it now freely and entirely. Moreover, relying on their experience and knowledge, members of the community may help identify people and places that appear in the different images. This is important, because among the photos of the collection are often appearing forerunners today’s inhabitants of Cluj and of Cluj County, in their various capacities and during activities performed in various fields such as agriculture, industry, trade, education or being simply pedestrians that photographers have captured by accident. The collection includes images from other Transylvanian counties as well, such as Sălaj, Bistrița-Năsăud, Alba and others. The archive also constitutes a real Pantheon of writers, artists, actors, scientists and other professionals, Romanian and Hungarian personalities, who appeared routinely in the articles of the two newspapers. Not least, the collection is an extremely faithful mirror of the communication strategies of communist dictatorship. In addition, the photographic material is documenting the life and work of former industrial and agricultural units in the city and county of Cluj, in factories, cooperatives and various institutions, some of which are part of the historical heritage of local industry. Many of these objectives can no longer be seen nowadays because in recent decades have been dismantled, demolished or simply destroyed by indifference. Who were the photographers of the Cluj dailies? Among the photographers who worked in the newsrooms of the Cluj media outlets of the former Communist Party, only two are alive today: Ferenc Deák and Ferenc Csomafáy. The first continued to live in his hometown of Cluj, the latter’s fate led him to the United States of America, to New York City, where he became a known photographer by the name of Frank Deak. They both very kindly answered our questions about the past of the press photo in Cluj, sharing their knowledge. 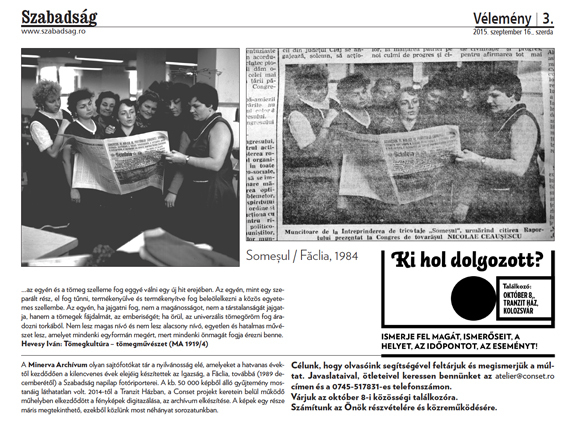 Important data related to photographers of Cluj newspaper Igazság, were kept in excellent memory of Sándor Dózsa, who served as editor of the Hungarian daily since 1950, and who provided us with helpful information. Therefore, we managed to find out that in the beginning the photographer of the Igazság was Elemér Erdélyi and that of the daily Făclia Ionel David. When Erdélyi retired on the eve of 1960 the young Ferenc Deák followed him at Igazság. Around the same time, Rudolf Wagner followed David at Făclia. Ferenc Deák left the Hungarian language newspaper around 1965. He was succeeded at Igazság by Ferenc Csomafáy, who remained the newspaper’s photographer until 1974. From the latter baton was taken by Rudolf Wagner, who subsequently became both daylies’ photographer. Wagner was succeeded during the second half of the 1980s by Nicolae Petcu, who along with his brother, Ioan Petcu, became after 1990 newspaper photographers of the daily Adevărul de Cluj (originally Adevărul în libertate), later the Făclia of today. Since the second half of the 1990s, Ioan Petcu photographed also for the Hungarian language daily Szabadság that – according to the request of the late colleague – published his pictures under the name of János Rigó, as a permanent allusion to Petcu’s favorite cake bearing the same name. In the period before 1989, three other great photographers of Cluj worked for the two newspapers: Tamás Szabó, Ion Lespuc, and Ioan Miclea-Mihale. The latter was in fact the Dolgozó Nő women's magazine photographer. Especially Sándor Szabó, a prominent member of the philharmonic orchestra, took pictures of concerts, soloists and conductors performing at the State Philharmonic of Cluj. He authored a significant portion of the images published by the daily Igazság about the musical events of Cluj. Since 1989, photojournalist of the daily Szabadság was for a while Károly Feleki (currently professor at UAD Cluj), followed for a short period, until 1993, by Iván Rohonyi Demko, who returned to the newspaper in 2006, and is also today the newspaper’s photographer. Between 1994 and 2006, the Szabadság newspaper photographer was Előd Gyurka, who after the retirement of Ioan Miclea-Mihale worked as a magazine photographer of Családi Tükör, which continued Dolgozó Nő magazine. Unfortunately, photographic material from the Minerva Press Photography Archive does not include the name of the photographers and – with few exceptions – pictures’ authors were not identified so far by other methods. Obviously, the establishment of the authorship of the photos will require a very serious research work, by the end of which there is hope that this huge collection will be processed scientifically. Conset is a temporary institution centered on different authors’ studios. Starting from the topics and nature of their practice, we conceive public forms with which to contribute to the widest possible contextualization of artistic production, juxtaposing different forms of knowledge external to the artistic field. 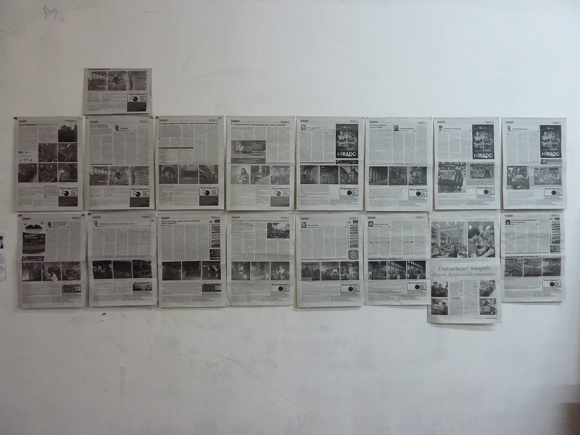 Through sustaining its open studios, Conset wishes to enquire the different positions of authorship, domesticated in different institutional settings today. We wish to offer the necessary space for contemplation and development of new work, modeling at the same time an experimental institutional frame, which expands the horizon of expectations and incorporation of possible meaning productions. We believe that the reinvention of institutional forms and the renegotiation of our relations to infrastructure and to each other are necessary to overcome the historic deadlock in which we find ourselves. The active involvement of diverse publics, reprocessing and radical interpretation of ones own production fuels new significance, advancing the capacity for dialogue and for articulation of society through art.